P>make any outlet a smart outlet. The Sylvania smart+ ZigBee smart plug is simple to use and easy to connect to your compatible smart hub. Run your home on your Schedule by automating the small appliances and lamps you use every day and control them through your smartphone or tablet. Create schedules and automations to turn your devices on and off when you need to. 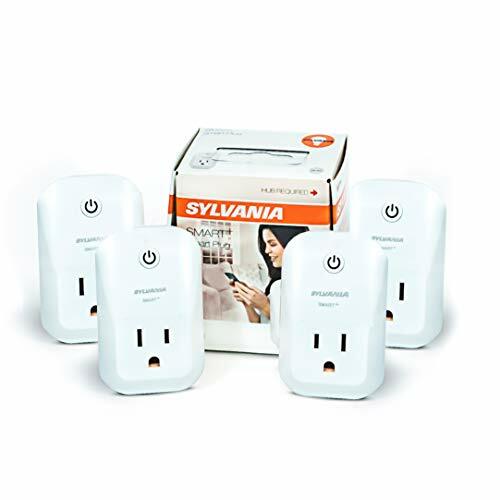 The Sylvania smart+ ZigBee smart plug is ideal for floor and table lamps, as well indoor holiday decorations, fans, and other small appliances. When connected to a compatible smart hub, use voice controls through amazon Alexa </stronger the Google assistant </stronger turn your devices on and off. Simply connect your Sylvania smart+ ZigBee smart plug</strongest; to your compatible ZigBee hub and start creating your own personalized smart home experience. A compatible ZigBee hub is required to control this plug. Pair your plug to a compatible ZigBee hub such as SmartThings, Wink, or Amazon Echo Plus. Turn any outlet into a smart outlet. Easily plug your device into the smart plug and use your compatible app or voice assistant to turn your device on and off. Ideal for holiday decorations, fans, small electronics, floor lamps, table lamps, and more. For indoor use only. Integrate voice control by pairing an Amazon Echo or Google Home smart speaker to your compatible ZigBee hub. Enjoy the benefits of hands free control by asking to turn your plug on or off. Extended features: Use away from home control to create schedules to automatically turn your plug on and off at designated times.